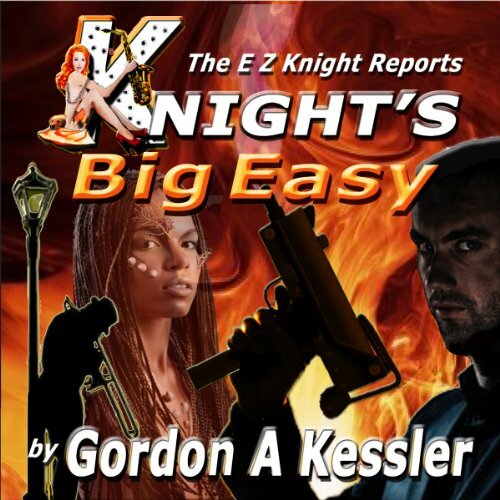 Killing is never easy for E Z Knight. But when he's doing away with some really despicable bastards, it's not all that difficult. In Knight's Big Easy: Voodoo, hoodoo and a girl named Poodoo make this year's Mardi Gras the most fun, but also the most dangerous party of all for E Z Knight! Knight goes to New Orleans to find Parole Officer Tamara White Cloud's AWOL USMC son, and soon finds out that L/Cpl Billy White Cloud isn't the only one who's gone missing. There, he uncovers the largest human trafficking organization since US Emancipation. Led by a Voodoo King named Papa Legba, the slave ring preys not only on young runaways and homeless children, but also kidnaps people from their own homes, and then sells them into prostitution and sweat-shop labor. Knight works with a retired jazz musician named Black Zack who restores old horns in a shop called Jazzy Brass. Together, they team up with FBI Special Agent Pooh Dooley to find Billy and to stop the slave-traders. However, Knight's old musician sidekick might be more than he appears. Time is running out. A cargo ship loaded with over 500 children is off to the deepest waters in the Gulf. With the threat of being exposed, Papa Legba has ordered the ship sunk as soon as it reaches Sigsbee Deep. But Knight's not worried about dealing with the two-dozen armed men on the slave ship, or the nighttime HALO jump he must make to carry out the rescue - rather, it's the Voodoo Queen named Marie, who won't rest until she's turned E Z Knight into a zombie, that's making his skin crawl.